Making your own healthcare decisions is an important right. Doctors are required to inform you about various treatment options, their risks and benefits, and their complications. Unfortunately, there may come a time when you can no longer communicate with doctors. In that situation, it is advantageous to have an advance directive to speak for you. A directive contains your instructions regarding what types of healthcare you would prefer to receive. 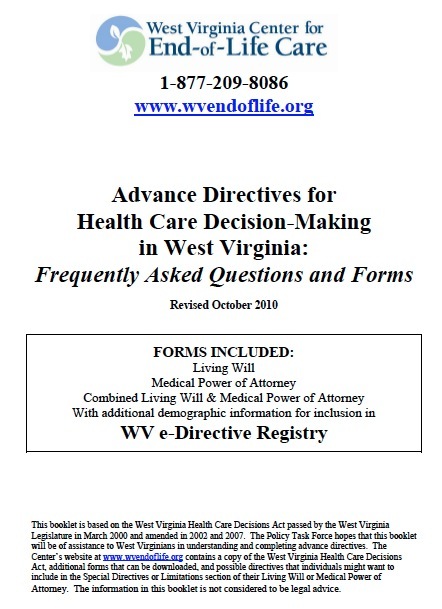 West Virginia law recognizes medical powers of attorney and living wills. The medical power of attorney enables you to name an agent to make health care decisions for you when you cannot communicate. The document typically empowers your agent to make decisions relating to any medical treatment, surgery, medications, admission to health care facilities, nursing, and home care. This includes whether to prolong life-sustaining treatment as well. You may limit these powers in any way you want by writing specifically what you prohibit the agent to do. It is critical only to select an agent who knows you well and understands your values so that he or she can make the right treatment decisions for you. The living will instructs doctors not to continue life-sustaining treatment if you are in a persistent vegetative state or you have a terminal illness.